Protect your iPhone 6 Plus with a hip and funky cover. 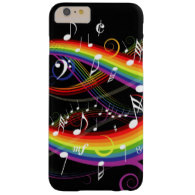 This collection features cases with musical designs, from classical to rock, from sweet to stylish, which will ensure your treasured iPhone 6 Plus will not become a victim of bendgate! 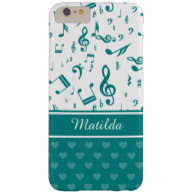 A pretty case for the music lover featuring patterns of musical notes and love hearts in teal green and white with custom text for your name. 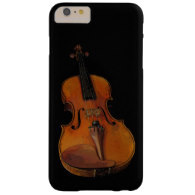 For the violinist or lover of classical music, an elegant iPhone 6 Plus case with a photograph of a violin on a stylish black background. with custom text for your monogram and name. 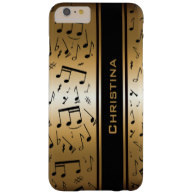 Elegant and stylish, this iPhone 6 Plus cover features a pattern of music notes in black on a golden colored background. Just add your name! Customize this iPhone 6 Plus case with your monogram initials on a stylized semi-quaver on a striped background in shades of blue. 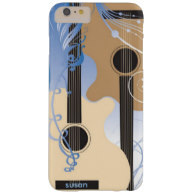 Guitar lovers and guitarists will love this case for the iPhone 6 Plus with two acoustic guitars with stylish flourishes on a gradient blue background. 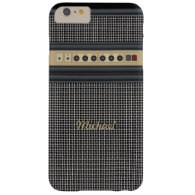 iPhone 6 Plus cover which looks like an amplifier. A fun and hip musical design for the musician and music lover. 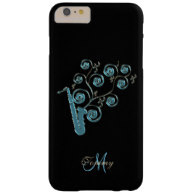 A collection of iPhone 6 cases featuring designs of musical instruments, including pianos and keyboards, guitars, violins, saxophones and more. Musical notes, cassette tapes and speakers abound in this array of designs to suit all tastes. Protect your iPhone 6 Plus with a hip and stylish case which shows your love of music.